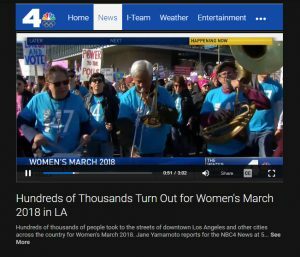 Local 47 musicians & union members joined hundreds of thousands at the 2018 Women’s March Los Angeles. Activists converged on downtown the morning of Jan. 20 marching from Pershing Square to City Hall as part of the second annual Women’s March, the largest of dozens of similar protests held around the nation. The message of the #metoo movement was at the forefront, with many demonstrators waving signs calling for the end of sexual violence and assault. Among other issues raised were equal rights for women and an end to attacks on reproductive rights, LGBTQIA rights, workers’ rights, civil rights, disability rights, immigrant rights, Indigenous people’s rights, and environmental justice. AFM Local 47 led the entertainment union contingent, with musicians marching alongside members of Writers Guild of America, SAG-AFTRA, and the Directors Guild. Labor representing at the Women’s March comes at a time when unions throughout the nation are working to more closely scrutinize workplace conditions and “industry norms,” and taking steps to improve conditions for all working people. At City Hall, celebrity speakers addressed the crowd, including actresses Viola Davis, Scarlett Johansson, Natalie Portman and Laverne Cox. In her impassioned speech, Davis reminded women that they must fight for their liberties and rights. Davis concluded by saying that until we’re all free, none of us are. “As we live on earth, we’ve got to bring up everyone with us,” she said. She finished by saying her hope for the future is that we “never go back,” and reminding the crowd that marching isn’t enough — that we all must “keep it rolling” when we go home. This entry was posted in All News, Features and tagged 47 Strong, activism, Women's March, Women's March Los Angeles on January 22, 2018 by admin. Me and my daughter are victims of ongoing physical and emotional assualt by some of my family, persons I believed were friends, my neighbors, and my ex boyfriends and his family including investors in L.A. that I sued for discrimination, harassment, wrongful forclosure of investment properties, and who falsely claimed I abused my daughter. I went to more than six states across the U. S. and was continually harassed and stalked me even via taxi cab rides so that I could not file complaints against them. The harassment included breaking down my 4th vehicle in a year, then stealing my drivers license and debit card w aid of Terri Richards from the WAGNER hotel in New York. They also own and operate the Public Hotel which harassed me and the CROWN PLAZA in Phoenix,AZ and had someone jimmy the locks my hotel room so it would not lock. Several items related to my daughters case are missing. Saba limo had a man named Hasan give me to San Diego and then a man associated w them in San Diego named Singh drove me to L.A. Both took items while I was sleep and I am not sure what else happened but I beleive that I couldve been physically harmed. I still have not found my daughter Mikalah Newman. Her dad never wanted her and he is a private contractor for hire for the bank and employer I sued. Judge Theresa Sullivan is a friend of his family and she violated so many if me and my daughters rights to obtain independent counsel of our choice and to cross examine all persons who said I abused Mikalah. All social workers and mandatory reporter named Heather from Ucla knew Mikalahs father so they helped him take her away from me. Everything was staged so even now they have not allowed me to see nor speak to Mikalah since I filed a motion showing the officer in Roseville that wrongfully arrested me for tresspassing at the school district, mislabeling it as a college, was tied to the manager of my former employer at Xerox. Additionally, the holding Officer and jail staff were associates the same investors including some family members and Newmans family. I am now back in L.A. seeking to get another car repaired and its hard to get money from my account with no I.D. this time around from the bank manager. The othe occupants in my condo complex are related party investors that moved here before i moved back in 2014 after short selling my home in Altadena to save my apartment near USC from the banks threat to stop taking payments and foreclose. After all was done in 2016, they took most of the seven properties I owned and my daughter and had gangs threatened my son so he is on their team and cant do much to help. Last they killed my father by infecting his feet and he fell and never recovered. I too have been harmed as they have made my body and feet swell, then stick holes in the sole of my feet and take out the cushion so it hurts to stand for a while. They caused my dad to have infection in his fingers so some like his toes were cut off. Now my fingers are numb on occasion. While i stayed at the Crown Plaza I found that my finger tips were very sore and slightly numb. Im in a dilemma because no one in my family is supposed to help me so that I keep my daughters paperwork with me as the same people including my and my mothers neighbors and now I know my family too never want me to get Mikalah back and steal all her records and pictures. They have control of my bank accts too becuase they hire the manager at each bank I have accounts at.